This is one of the cardinal rules of statutory interpretation. It applies not only to acts of Congress, but to state legislative acts as well. A couple of weeks ago I posted New complaint filed against Secretary of State Michele Reagan – will the AG Act this time? Ignoring the cardinal rules of statutory interpretation, Arizona’s Attorney General agreed with our law-breaking Secretary of State, because in Arizona IOKIYAR. 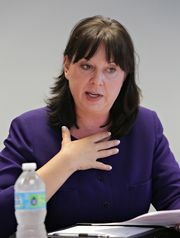 Tom Ryan, a Chandler attorney and political activist, argued in a complaint on Thursday that state law requires her to issue a new manual for every election cycle, as previous secretaries of state have done. He alleged that Reagan’s decision to ignore that requirement was a felony, which could have forced her from office had Attorney Mark Brnovich pursued an investigation. But in a letter to Ryan on Tuesday, Chief Deputy Michael Bailey said there are several interpretations of the statute. Previous secretaries of state have issued new manuals each cycle. Bailey said one could also argue that the statute requires a new manual for each individual election. And, he noted, Reagan has interpreted the law to mean only that a procedures manual must be in place, which is what the secretary of state decided to leave in place the manual from the 2014 cycle. Bailey said the Attorney General’s Office isn’t taking a position on which of those three interpretations is best. And because the law requires knowing or willful violation, Bailey said there’s no basis for criminal charges. “We note only that the Secretary’s interpretation of the statute is at least plausible,” Bailey said. Ryan, who has been fiercely critical of Reagan, said he was disappointed in the decision, but that he has no plans for further legal action regarding the manuals. “While it seemed a very clear cut violation to me, the AG’s office doesn’t see it that way,” Ryan said. Ryan’s complaint had potentially severe consequences for Reagan. In his complaint, he cited a law stating that “a person charged with performance of any duty under any law relating to elections who knowingly refuses to perform such duty” is guilty of a class six felony. Arizona law prohibits anyone convicted of a felony from holding elected office. The GOP culture of corruption runs deep in Arizona. Tea-Publicans will continue to violate the law with impunity unless and until the voters of this state hold them accountable by kicking them all out of office. It’s time to drain the swamp of the GOP culture of corruption.